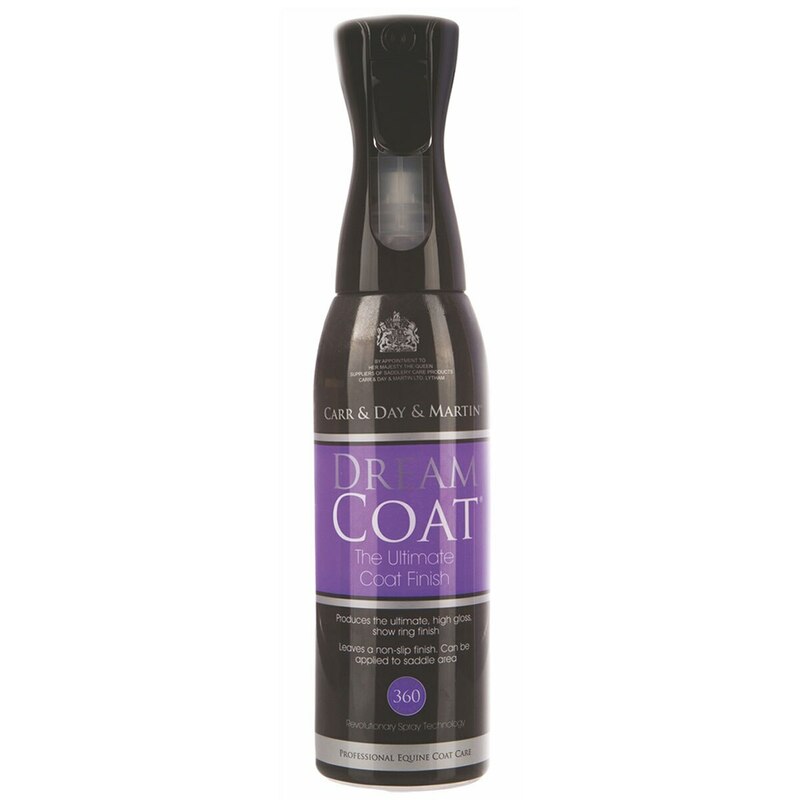 Dream Coat® conditions the coat to leave the ultimate high gloss shine. The fine mist and tiny droplet size give a perfect, even finish, every time. The non-slip formula can be used prior to riding and used on the saddle patch. Features innovative Equimist 360 spray bottle for continuous and even application at any angle. Carr & Day & Martin Dream Coat® is rated 4.9 out of 5 by 8. Rated 5 out of 5 by Amanda from big thumbs up smells great and leaves the coat shiny soft and not greasy. Rated 5 out of 5 by SloeRyder from LOVE THE SMELL! First off it smells like FruitLoops! I love this spray. The nozzle is really nifty to use, and it doesn’t leave a residue or make your horse slippery. Rated 5 out of 5 by Leesha5593 from My Go-To Show Spray! I've been using this product for over a year and it is seriously the best! It leaves the coat so soft and shiny! I was hesitant at first given the cost (I have the big bottle) but it was worth every penny. Rated 5 out of 5 by mccathas from Great results! I bought this product to help reduce grooming time and it works. My horses coat feels super soft and doesn't seem to attract as much dirt. Plus he smells nice, which is a great bonus! Rated 5 out of 5 by Stephanie from Best Coat Spray Ever!! I have been using Dream Coat for a few years and I was so happy to find that Smart Pak started carrying it!! It is my secret weapon for a beautiful coat that adds shine and keeps the dust away without being slick! Rated 5 out of 5 by karsonhunter from So far so Good! Haven't had this too long, but a barn buddy recommended it, and her horse's coat was lovely. It does make my horse feel super smooth and soft. Not to mention this stuff smells wonderful. Love the unique spray mechanism. I will purchase this again. Rated 5 out of 5 by Aimee Leigh from Will add a mirror shine to your horse! My horse has a nice shiny coat on most days (good feed, daily grooming, that sort of thing...everything you learned in Pony Club was true! )...but some days (like for shows and clinics), you want to add a little extra oomph to your turnout. This spray does that and more!!! It smells divine (lemon grass) and adds a gloss to my gelding's coat like nothing else on the market. I don't spray it directly on the horse - I add it to a sheepskin mitt and then wipe down the coat. Never noticed my tack slipping with this technique and one bottle lasts forever. Highly, highly recommended!! !